One of the most interesting end of season jobs for AUTOSPORT is collating the annual Team Principals' Top Ten Driver rankings. The idea for the poll came during a post-work drink a few years ago with now editor-in-chief Andrew van de Burgt as we threw around random thoughts on trying to do something a bit different with end of season reflections. When the concept was suggested to the teams – with the proviso that it would only work if they all agreed to take part – there were a few nervous days of waiting for the response. When the answers came, however, they were all in favour of it – especially because of the strict level of secrecy that the poll operates under. 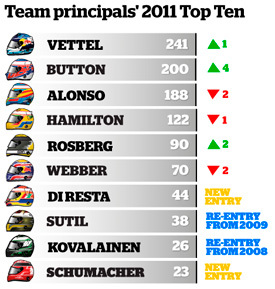 The process is simple: the team principals provide their individual top ten under the strictest of confidence (only two people ever know the answers – me and them), and the results are then converted into points (25-18-15-12-10-8-6-4-2-1) with the scores added up to find out which drivers the bosses felt had done the best job in 2011. The anonymity works on two levels: one by ensuring that the team bosses are actually able to take part in the poll – because there is no way they would do so if they had to put their names to it. And secondly, it ensures a totally honest assessment of the drivers – for there have been some answers over the four seasons it has been run that would shock some men in the cockpit. 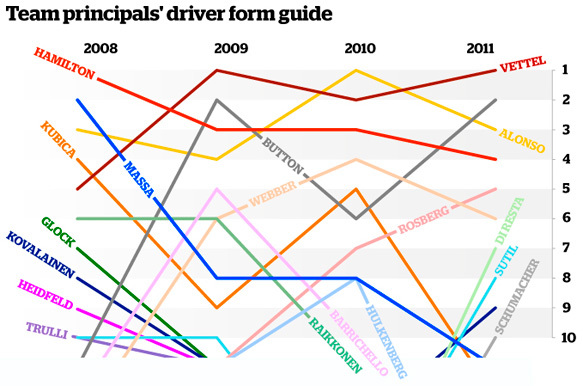 Some years the results have been a surprise at the front – with the winners in 2009 (Sebastian Vettel) and 2010 (Fernando Alonso) not actually going to the world champion. But, on the back of his dominant campaign this year – and near faultless performances throughout the season – there was little doubt that Vettel was going to be the first man since Lewis Hamilton in 2008 to end the year as world champion and the team principals' best driver. In fact there are very few bombshells in the top half of the list – with only Mark Webber being further down the order than he was in world championship ranking. Of more interest is the back end, and seeing which drivers outside of the Big Four teams have caught the attention of the team bosses. And it is Paul di Resta who has emerged as the leader of that pack, after his impressive rookie campaign delivered him seventh overall in the standings. But things were very close between him and team-mate Adrian Sutil – with opinions among the team bosses being fairly evenly split as to which of them had done the best job. In the end the fact that they were separated by six points shows how close the voting was. One of the feel-good outcomes of the team principals' top ten is the fact that Heikki Kovalainen's amazing efforts at Team Lotus were noticed elsewhere in the pit lane – as he secured ninth place overall. The Finn really stepped up his game this year, revelling in the atmosphere at the Hingham-based outfit and producing an amazing run of qualifying performances that left Jarno Trulli firmly in the shade.